Identity is a funny thing and within the foundation of identity building in Canada lies a certain type of nested logic: a colonial logic, influenced by an imperial logic — both these ways of thinking have shaped false identity constructs that circulate within cultural interests and interpretations. This logic has existed as a totality that historically excluded all that was other and built racial hierarchies that continue to harm our country and damage our healthy social relations. Racial superiority written in law and legislation has shaped the cultural landscape of Canada so much so, that through the written law of subjugation, some communities are still seen as inferior. I am curious how colonial logic differs from Indigenous logic and I will attempt to locate this difference. There are a few layers of the gaze at work here in Canada when viewing the Indigenous body and art, beginning with the imperial gaze, which shapes and influences the colonial gaze. Canadian systems of knowledge production began with the Commonwealth settler nation-state; everything British was transported to “our” pedagogy and governance, which mutated into a settler gaze. And the settler gaze morphed into the Canadian gaze, which has been informed by the imperial/colonial gaze, but is very specific to the Canadian experience. The gaze deepens and grows into the imperial/colonial/settler/Canadian gaze, four layers of the gaze heaped onto Indigenous bodies and culture — these layers of the gaze are all Eurocentric in nature. Then a fifth layer of the gaze develops upon Indigenous backs and that is the newcomer3 gaze taken on by immigrants arriving after 1965. I have selected this date as a result of the launching of the official Canadian national flag, and the then-recent changes to the Indian Act. This adds up to the imperial/colonial/settler/Canadian/newcomer gaze. Five layers of interpretation, stereotype and power that control and filter views of Indigenous bodies and art. The imperial/colonial/settler/Canadian gaze can be applied to art from diverse cultures as well. But also these diverse cultures can contribute to judging and viewing aboriginal bodies and art through one to five of the gazes, because part of becoming Canadian is embedded in an imperial/colonial/settler logic which has a racist paternalistic view of the Indigenous body and culture. Within the realm of the gaze is “the wound,”4 because the gaze is searing and can judge, harm and puncture. Something is injured within Canada’s identity formation and this injury was inflicted as a result of the imperial/colonial/settler/Canadian gaze, through its position of power. The injury is a cultural wound5 and its broken status continues to receive healing through the production of art. The artworks in Ruptures in Arrival: Art in the Wake of the Komagata Maru (2014); Yellow Peril: Reconsidered (1991); First Ladies (1991); Indigena (1992); and Land, Spirit, Power: First Nations Art at the National Gallery of Canada, (1992) — amongst other exhibitions — reveal the cultural wound. And through the reveal, the wound is being doctored and, in turn, Canada is being doctored and is healing from its imperialist racist past and present. Thankfully the gaze can be turned back (as theorized by Jacques Lacan) — or, at the very least, it can be met with a lateral glance — not as an exploitative power gaze, but rather the glance becomes a way of looking that encompasses truths and is nurturing. So, the looking back is about healing, as opposed to oppressing or harming. The late 1980s and early ‘90s in Canada was a time of self-representation in the arts. Marginal voices needed to be heard to allow for self-expression, but also to inform publics about the multiple shared sites of oppression and resistance to the cultural hegemony that had shaped and defined the Canadian cultural landscape. Exposing the histories of oppressive laws to a largely ignorant art public through creative artistic expression was an emotionally charged act. When unpacking race and the body politic within a Commonwealth settler nation, emotions will always be, and should be, part of the discussion. Heart talk.6 Talking from the heart. By establishing one’s own agency within the “dominant” art community, Indigenous people and POCs (People of Colour) were revealing injustice and giving social, political and, in some cases, spiritual agency to their parents, grandparents and themselves, as artists and as citizens. Ancestral voices that were denied through state authority and devalued through pedagogy and stereotyping were being recognized and articulated by artists. Artists recognized that their parents and grandparents were greatly harmed, rendered voiceless and legally oppressed. This history, as well as the current reality of oppression in Canada, is a rich and complex site to draw upon for art making. How has oppression, both as a historical fact and as a contemporary experience, been rendered into the realm of art making? What is the aesthetic of the oppressed in Canada? Do we have one? And is that aesthetic a self-rendering of the affects of legislated oppression? The reveal. To reveal injustice. Within the larger field of aesthetic theory, the aesthetics of the oppressed seem well placed within a kind of peace education7 that advocates for an ethic of care all round. The visual in peace education has an ethical purpose. Louis Riel stated, “My people will sleep for one hundred years, but when they awake, it will be the artists who give them back their spirit.”8 Perhaps this statement foreshadowed the volume of state and public oppression that Indigenous people would endure while also foresighting that the artist voice could reveal injustice. First Nations and artists of colour were expressing their experiences as “outsiders” to the dominant culture. There was a demand for ethical accountability from the cultural brokers regarding equal representation in the arts in Canada. What voices were not being heard and why? Erasure and cultural appropriation were no longer acceptable within Canadian public cultural institutions. Ethics, or the lack thereof, were being questioned — and this meant going further than any prescribed essence of identity. Identity politics located abuses of power within the very liberal field of art. The languages of an “activist art practice” or “activist academic” were being spoken, along with terms like “settler allies,” “people of colour solidarity” and “shared oppression”— these ideas and terms were seen as threatening, radical and visionary. This new language was perceived to be threatening because cultural power was being questioned and demands were being placed upon it. It was radical because the micro superstructures of Canadian art were being challenged and questions of access and inclusion were demanded. And it was visionary because the idea of critical and ethical cultural democracy in the arts had the potential to enhance public discourse and social relations through diverse and sometimes political and spiritual voices. The battle for cultural inclusion was taking place in Canada’s liberal artist-run centre movement and quickly terms like “cultural terrorists,” “hostile takeovers” and “white supremacy” sadly began circulating. And signs of neoliberalism (profit with no regulation) in parts of artist-run culture became very apparent. First Nations and POCs asked the artist-run centre movement to share cultural space and power ; reactions ranged from fear to an eager readiness to participate. There was an attempt to lead with distinct cultural concerns as forms of “resistance” to Western aesthetics and interpretive hegemony—and not as reductive essentialism, but as strategic essentialism to indicate that our forms of cultural production are valuable and that the Euro-Settler Canadian art institutions needed to acknowledge the gaps and reconsider what Canadian visual culture is and should be: a place for all artists. Pedagogy has played a key role in the structural dehumanization of Indigenous culture and bodies. The bias implied right in the category “non-Western art” subordinated anything deemed to be outside of “Western art;” thus “non-Western art” was implied to be inferior and denied entry into the timeline of official art history. Indigenous knowledges have been left out of philosophy and science; Indigenous spiritual knowledge is excluded from the conventional field of religious studies. Compounded by the criminalization of Indigenous culture for 80 years, Indigenous knowledges have been left out of the very production of knowledge and meaning in Canada. And the delegitimization of our knowledge has supported the stereotype and the negative identity constructs that have a deeper history. This violence of delegitimization has done much damage tragically within Indigenous communities as well. Identity politics, as it is called, and which apparently included my art practice, allowed many artists to articulate and contextualize their own silenced histories within the larger field of colonial history. Identity politics resides within the realm of the cultural wound and has curative elements. Identity politics for me are a gift, a healing and a cure: a gift because artists gave generously, a healing because truth heals and a cure because the oppressed have spoken to the wound. Historically, education supported the stereotype —identity politics allowed for a space to deconstruct the stereotype and to reveal how it worked while exposing systems of false knowledge production that maintained authority over and defined the other. This false knowledge and authority gave rise to an ideology of racial superiority with racialized hierarchies. Hidden within this ideology, there was a legitimization of the expansion of the means to reproduce capital, which in Canada has impacted many First Nations communities who live well below the poverty line. The stereotype assisted and assists with keeping Indigenous people in poverty. In terms of class privilege, discussion of class is often seen as a departure from the struggle for cultural equity for First Nations artists and POCs, but we share the burden of historical oppression imposed by the state and maintained through public discourse and perhaps desire, and we are all subjected to the functioning of the stereotype. 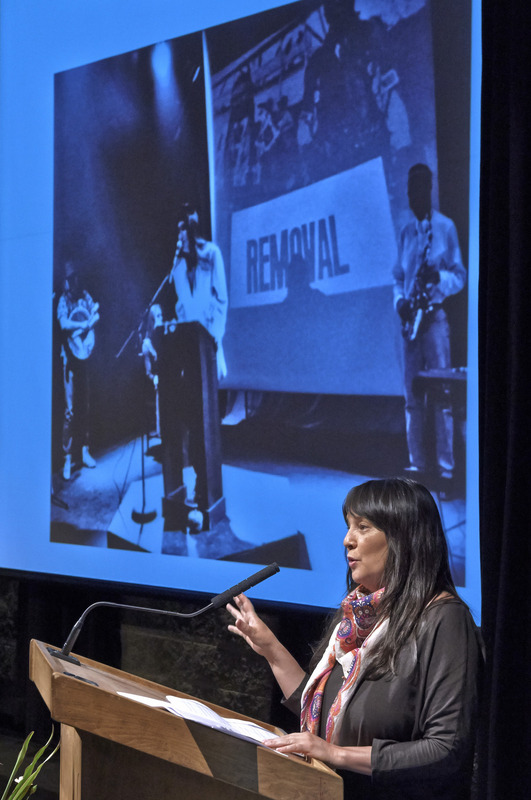 Yet against this backdrop, Indigenous artists and artists of colour have increasingly played a significant role in shaping the Canadian art and visual studies schema. Through persistence and a will to be heard and seen, many artists who engaged with the topic of race and the body politic in their practices have contributed to discussions of anti-racism within the very production of art and culture in our country. These efforts and others have reshaped arts funding bodies as well, where it became unacceptable and even undemocratic not to have a diversity of voices at all levels of assessment. In the last 15 years there has been a tremendous influx of Indigenous art history courses and material-based art making classes. Identity politics in art have contributed to unpacking colonial histories and inserting a first person narrative for marginal voices. This articulation presented both a theoretical rupture and an intervention of difference through the actions of subordinated groups. For some, art practice changed to praxis and a way of life — it became a way of living a political life that meant making political choices and voicing political concerns within the realm of art and culture and further into pedagogy and how we teach art. The hegemony (or “total social authority,” as theorized by Antonio Gramsci), both through coercion and consent, within the superstructure of art history, was being questioned. Interpretative power was being critiqued and the influence of Euro-Canada’s stronghold on Canadian art history and exhibition space was in question. A crisis of representation and authority has visibly taken place and expert knowledge reassessed. The problem that remains is that even through locating and establishing one’s own agency, a marginal identity is still “the Other” and perhaps because of the nature of “the Other” and of power, we will always reside as “the Other,” within the stereotype, with limited power — hence, the persistently high poverty levels in the aboriginal community. As Other, Indigenous art continues to be at the service of the consumptive nature of pedagogy and the market — Indigenous cultural production is either a research subject or a commodity object. Through exhibition, collection and production, Indigenous art has firmly established agency, but at the same time this agency exists within the realm of the perverse commodity or research fetish. Along with racial oppression, Indigenous people still endure class struggles which are not fought in the gallery space. Further, the superstructure of the regime of capital doesn’t allow for Indigenous voices to be valued in any politically meaningful way, or even for the artists’ voices to be heard. Within these superstructures of political power, art circulates as capital, but generally detached from the artist’s (raced or gendered) body or (political) voice. And when the artist’s body matters, it’s generally to say, the artist is young, old or dead, but never as the speaking subject. The artist body, regardless of class, race or gender, at some point doesn’t matter in matters of capital. Class, race or gender privilege has played a significant role in the commerce of art, but at some point in the superstructure of art, it’s about art as capital, severed from the gendered/raced/classed body. (Of course, we mustn’t forget the plea of the Guerrilla Girls in all of this). As capital, art reproduces class over and over again, and certainly regarding the Indigenous community, class structures and struggles haunt the devaluation of the people; in other words, Indigenous bodies are delegitimized through class oppression. Class continues to play a significant role in de/valuing Indigenous people; also, class maintains interpretative art power in general. As in Karl Marx’s well-known definition of superstructure, art is blatantly a commodity — the vulgarities of the final stages of capitalism10 could be said to be encrusted in artist Damien Hirst’s notorious diamond skull, For the Love of God (2007). Although I don’t predict an end to art as a result of art objects like Hirst’s diamond skull, it seems this highly calculated commodity is suggesting the end of art as non-commodity — art in certain class structures can now only circulate as commodity after the diamond skull. If this is taken as a fact, then where does this development place Indigenous art and art by POC? Of course artists will always make art for the love of art. But the capitalistic models of accumulation and consumption of art and Indigenous aesthetics need to be considered, as art is placed within the realm of commodity and use value. Canada, as a settler nation and Commonwealth country with institutions based in Anglo-British models, subjects all non-Western immigrant cultures to a Euro-Canadian dominance in art discourses and interpretation. What and who gives racism a concrete material force? Books? The text? Movies? State policy? And how do these practices legitimate the continuation of multiple oppressions and racism? Are we still teaching the stereotype? I suspect that art proper still largely belongs to the West; communities of colour or First Nations who wish to circulate in art’s arena must define their own rules of engagement knowing that the field is dynamic and complex with Western imperialist roots. And through cross-fertilization, all roots can be enhanced and the rhizomes expanded — connectivity through difference. Thankfully there are traces of identity politics in twenty-first century art. Discussions of race should always be welcomed as these discussions are still needed, and will be needed as long as racism persists. The reality of co-existence, not as a two-world duality or binary, but as the Whole, interests me —the Circle— and not to diminish difference, but to acknowledge and understand different histories and reference points. Canada’s racist legacy purported that difference was a threat and identity politics countered that we could engage in our difference without violence or oppression. Canada’s historical and current relationship with Empire haunts and informs culture-making in general. And colonial logic and power have influenced how culture, bodies and peoples are valued. Thankfully, power is not manna, and I use manna here as a nurturing spiritual entity. Manna is wisdom and what seems to be the fundamental difference between imperial logic and Indigenous logic is wisdom. I don’t see wisdom in power. So, if knowledge is power — wisdom is manna. I am hopeful, that as our young country called Canada grows, it will become wise, like the ancient Indigenous knowledges that haunt this land. And through wisdom, justice will prevail. To the east — where the sun begins the day. 2. Several theories of “the gaze” are at work here: Jean-Paul Sartre’s gaze as the crux of self awareness in the moment one is viewed by another; Michel Foucault’s gaze of power and authority; Ann Kaplan’s imperial gaze; and some extend this to Edward Said’s postcolonial gaze. I am combining all these theories of the gaze to establish the layers of the gaze upon Indigenous bodies and POCs, and the art made by these communities. 3. “Newcomer” as a term was used to describe the first Europeans who came to North America, but now it has shifted to refer to new immigrants to Canada, perhaps as a way of establishing a sense of homeland for generations of old newcomers and situating the new newcomers essentially as recent foreigners. 5. I am using the term “the wound” in the sense of an infliction. 6. The “cultural wound” is a result of centuries of denial, ignorance and racial hierarchies that haunt the Canadian landscape. 7. Artist and Professor Lisa Steele wrote that my writing style is a form of “heartalk.” In her words, “Heartalk is the perfect commingling of three words that, together, begin to adequately speak of the delicate yet probing vision that Dana Claxton has applied… heartalk reflects her ability to write in the same voice that she speaks in…” Lisa Steele, Introduction, Dana Claxton, “Aboriginal Screen Culture: celebrating 10 years of imagineNATIVE,“ imagineNATIVE Film + Media Arts Festival, October 14-18, 2009, Vtape, Toronto. 11. According to Karl Marx and Friedrich Engels the final stages of capitalism happens when there is a universal commodification of the world market. I am applying this loosely to the international art market. 12. “The Whole” is the circle of life, the universe — everything is connected.